Thursday, December 16 in Washington, D.C.
and around the D.C. Metro Area. Tomorrow, history will be made as veterans of U.S. wars will put their bodies on the line to build the movement against the wars in Afghanistan and Iraq. Veterans of Iraq, Afghanistan, Vietnam and other conflicts will lead a dramatic civil resistance at the White House to demand an immediate end to the wars. This act of resistance comes at a critical moment, with the war in Afghanistan poised to rage on indefinitely with increasing bloodshed, the occupation of Iraq still claiming U.S. and Iraqi lives, and the Pentagon setting its sights on new targets. 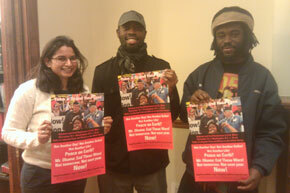 The ANSWER Coalition is enthusiastically supporting and mobilizing for this historic event. 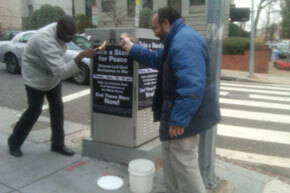 Anti-war volunteers have posted hundreds of posters in the D.C. Metro Area and have distributed hundreds of leaflets. Young veterans and active duty troops who are active in the ANSWER Coalition affiliate March Forward! are travelling from around the country to participate. We will be standing with those veterans and supporters throwing their bodies into the gears of the war machine tomorrow, Dec. 16 at 10am in Lafayette Park. We encourage everyone to join us to support this heroic act of defiance as we continue to build resistance to U.S. wars. We also ask you to please make a donation to help send as many young Iraq and Afghanistan war veterans as possible to Washington, D.C. for the Dec. 16 action. The ANSWER Coalition has been raising money to help pay for the transportation costs for young veterans, who could not otherwise afford to come to DC, so that they can participate in this important action.